Natural lip balms are easier to make than you may think, and they are especially nice when using nourishing herbal ingredients. When your lips are dry and in need of some extra moisturizing, this rose hip lip balm is the perfect thing to have on hand! 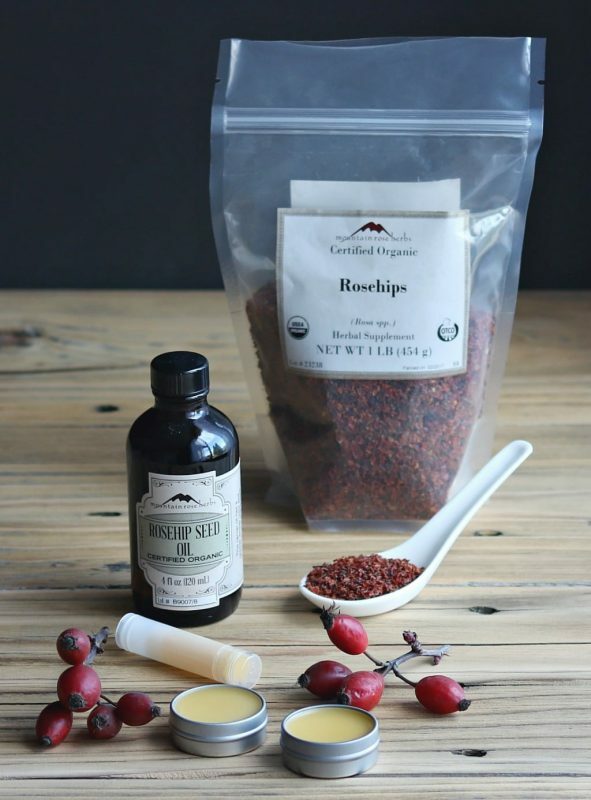 Rose hips are high in vitamins, and rose hip seed oil is highly soothing and moisturizing. Together they make an awesome addition to homemade lip balm! Before you make the lip balm you will first need to make a rose hip infused oil. You can use foraged rose hips, but they will need to be dried first. Then when you strain the oil you will want to make sure to use an extra fine mesh sieve lined with a few layers of cheesecloth to catch all of the irritating hairs. 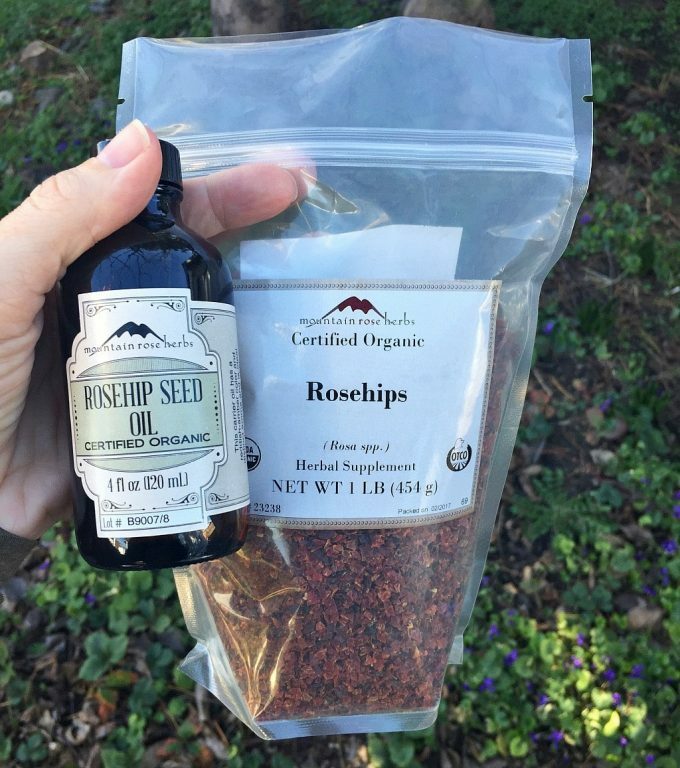 I find it much easier to use organic dried rose hips from Mountain Rose Herbs. When making the infused oil for this recipe, you will want to start with about 1/4 cup of dried rose hips and about 3/4 cup of carrier oil. I like to use a blend of equal parts coconut oil, olive oil, and sweet almond oil, but you can use whichever oil you prefer. Whenever I make lip balm I also like to add in a tablespoon of organic castor oil for extra moisturizing and shine. The rose hip seed oil will be added later when we make the lip balm. It is extremely light and heat sensitive, so is best added at the very end, right before the lip balm is poured into containers, rather than during the infusion process. Combine the dried rose hips and carrier oils in a jar, then cover the jar and let it sit to infuse in a cool and dark place for 4-6 weeks. It will turn a lovely pinkish orange color when it’s done infusing! After you’ve made the rose hip infused oil, then it’s time to make your lip balm! This recipe makes about 6 ounces of lip balm total. You will need small tins or lip balm tubes to keep it in, which you can purchase from Mountain Rose Herbs. This may just be my new favorite lip balm, although I do also love my Vanilla Lavender Lip Balm recipe. Any homemade lip balm is better than store bought in my book. Be sure to check out my Coco’s Herbals Etsy shop for all kinds of herbal goodness (including this Rose Hip Lip Balm)! I hope you love this rose hip lip balm as much as I do (I know you will)! 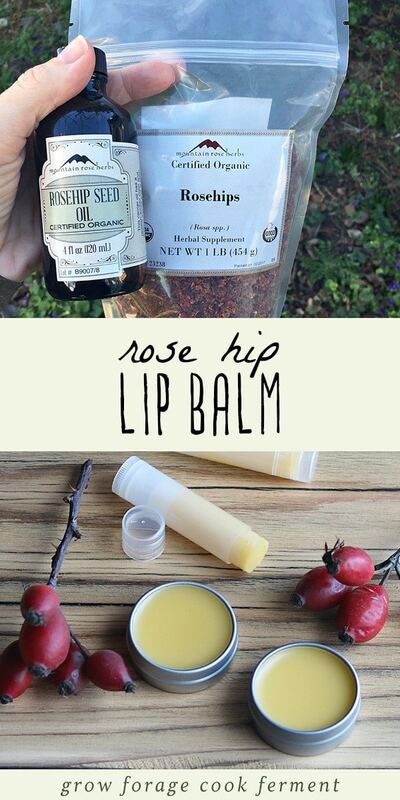 Learn how to make rose hip lip balm with organic dried rose hips and rose hip seed oil. It is a soothing and moisturizing herbal lip balm for dry lips! 3/4 cup carrier oil I like to use a blend of equal parts coconut oil, olive oil, and sweet almond oil, but you can use whichever oil you prefer. Combine the dried rose hips and carrier oils in a jar, then cover the jar and let it sit to infuse in a cool and dark place for 4-6 weeks. Put the infused oil and beeswax into the top container of a double boiler, and stir as the beeswax melts. (Tip: you can make a double boiler with a smaller pot, bowl, or glass pyrex measuring cup over an inch or so of simmering water. If you use glass pyrex, put something in the bottom of the pot that it can rest on, such as a canning jar lid). Once the beeswax has completely melted, add the shea butter and stir until it dissolves. When everything has liquefied, remove from heat and stir in the rose hip seed oil and sweet orange essential oil (if using). Carefully pour the mixture into small tins or lip balm tubes. Let them cool undisturbed for several hours. The lip balm will harden as it cools. Refined cocoa butter or mango butter can be substituted for shea butter, though because they are harder, the final product may also be harder than the original recipe. Hello, thank you for sharing this amazing recipe. 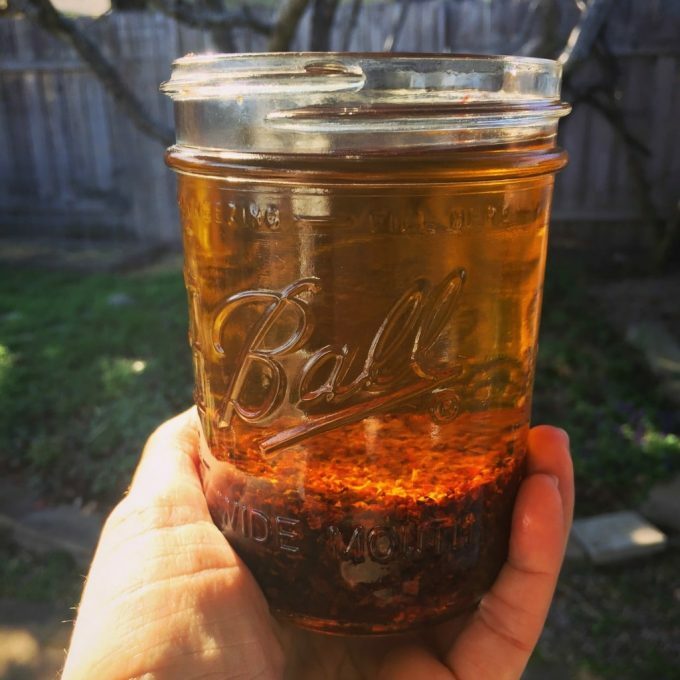 I took great joy and pride in making the rose hip infused oil from my own rose hips, and as you mentioned, the color is very pretty. I would like your thoughts on using a pure rose absolute oil rather than orange due to my concern of phototoxcicity and the comments the other posted mentioned regarding her reaction. Also, what amount would you recommend? Thank you in advance. A small amount of sweet orange oil is usually not a problem with phototoxicity, but you definitely want to avoid using bitter orange oil. You can definitely substitute pure rose oil, but it is very expensive! It’s not one that I usually have on hand so I don’t have a recommendation on how much to use. No, the amount of beeswax in it should keep it from melting. If you live in an extremely hot environment you may want to add a bit more beeswax though! 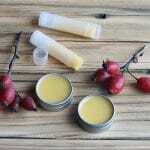 Hello, I love your simple and easy to follow recipe for lip balm. I am wondering if you could recommend a substitution for the shea butter? It is a tree nut and many people including me react to it. Would mango butter work? Yes, mango butter or cocoa butter would both work! If you use cocoa butter I would choose a refined variety if you don’t want a chocolate scent. Hi Colleen, I have rose hips that I have foraged and dried. Should I choose them up a bit before infusing? Thanks. I am anxiously awaiting delivery of your book, Healing Herbal Infusions, and I am looking very much forward to it. My question is this; I grow my own roses and I would like to make the rose hip infused oil. I am leaving the hips in tact in the plants until they ripen late fall/winter. Once they are ripe, is it okay to dry them gently in a dehydrator or is it best to let them dry naturally? Do they need to be crushed or broken prior to putting in the oil ( it looks like the ones in the package are crushed)? I have a variety of roses, are all hips red in color when they are ripe? Thank you in advance, I am so excited to learn from you! Hi Tracy! Either method is fine for drying. I would probably crush them a bit before putting into the oil so that they release more of their goodness :) Rose hips are red or orange when ripe, but in my experience sometimes cultivated roses have hips that stay green. Not sure why that is, but I would try to use red or orange ones if you can! Hi. This sounds lovely and will give it a try. Just wanted to share my experience with orange oil. 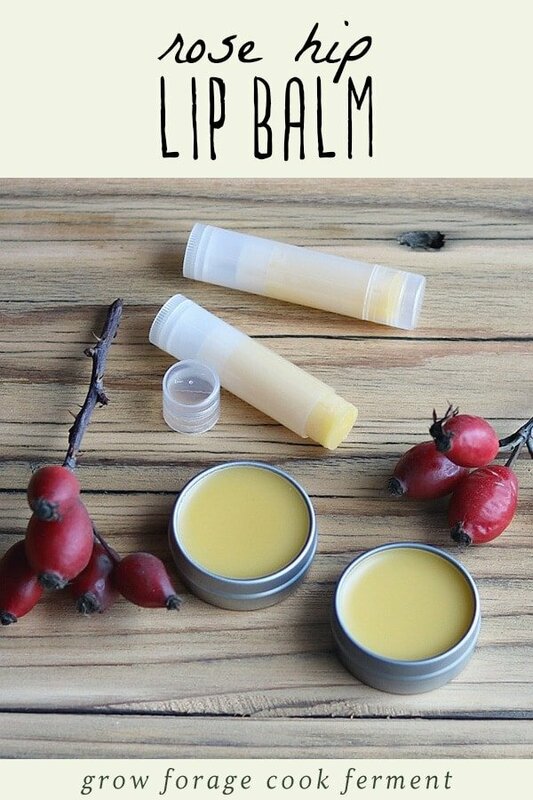 I made a bunch of lip balm tubes a year or so ago (not this recipe) and added orange oil to the mix. As I was nearing the end of the first tube, my lip starting swelling and peeling, included the area above my lip, which also reddened. It took a bit to narrow it down, but it was the lip balm. And this was two weeks before my daughter’s wedding. Fortunately they weren’t too puffy and peeling by then. Then last fall I bought some toothpaste that had tangerine oil in it. And after using it for several weeks, I started reacting again. Even when I coated my lips first with Vaseline (the only thing I could find to help my lips heal), the inside of my lips started feeling burned, so I had to stop using that. I have no problems eating citrus, but for some reason, I can’t use the oils, which is too bad as I love orange. So I just wanted to share in the hopes that others don’t have to go through this. My lips aren’t 100% yet, but at least they don’t look and feel burned. It sounds like you are sensitized to orange oil on your lips, what you described sounds like acute contact dermatitis and can happen with any essential oil, I happen to be sensitized to mint oils, not fun! Oh I have dried rosehips, I never thought of infusing them, thanks for the tip! I have been using rose hip oil on my face recently and it’s noticeably helping my skin. I will definitely give the lip balm a try! Thank you for all the time and effort you put into your posts I’m looking forward to your book.